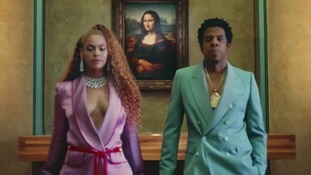 A video of Beyonce and her husband Jay-Z, featuring the Mona Lisa and other artworks, has been viewed more than 146million times on YouTube. Sir Philip Green owns Topshop and Topman. Beyoncé introduced to the world to her twins, Sir Carter and Rumi this morning in the first official picture of her newborns. The singer and her husband Jay Z have reportedly welcomed twins. Beyonce, 35, announced in February that she and husband Jay Z are expecting twins. Pregnant Beyonce has pulled out of headlining this year's Coachella festival following advice from her doctor. Beyonce has been named best International Female Solo Artist at the Brit Awards. The music superstars are both nominated for three of the most coveted awards at the star-studded ceremony in Los Angeles on Sunday. The singer is being sued by the estate of a late YouTube star over claims she used his voice without permission in her song "Formation." The pop star unveils more pictures from her photoshoot where she is seen cradling her baby bump and posing with her daughter, Blue Ivy.